With less than six minutes left in the game, place kicker Peter LoCoco kicked a 44-yard field gold to give favored the TCU Horned Frogs a three point victory, 27-24 over the Iowa State Cyclone at the EV1.net Houston Bowl at Reliant Stadium. TCU scored all but LaCoco’s points in the first half, after leading the Cyclones 24-17 at halftime. In a game that was clearly affected by errors, both teams combine for twenty penalties, four fumbles, and three interceptions. The Horned Frogs claimed an early lead when running back Robert Merrill scored on a 20-yard run that culminated a twelve play, 80-yard drive. They increased their lead with a seven yard run by tailback Aaron Brown following a Cyclone fumble. Iowa State scrambled back in the second quarter to score seventeen unanswered points, followed by an 84-yard pass from Ballard to wide receiver Michael DePriest to allow the Horn Frogs to take back the lead 21-17. Chris Manfredini kicked a 29-yard field goal with 15 seconds left in the half to make the score 24-17 in favor of the Horned Frogs. The Cyclones scored again with 1:53 left in the third quarter on a 22-yard pass from Bret Meyer to Todd Blythe, followed by a Bret Culbertson conversion to tie the score at 24. The Horned Frogs had a total of 410 yard offensively (135 yards rushing and 275 yards passing) along with being penalized fourteen times for a total of 134 yards. The Cyclones totaled 288 yards offensively (254 yards passing and 34 yards rushing) with six penalties for 51 yards. The victory extended TCU winning streak to ten games and gave them an 11-1 record for the season. Only Texas and USC have longer winning streaks, with 19 and 34 wins, respectively. The Horned Frogs had more to prove than just winning a bowl title, after being snubbed by the BCS and locked out of a chance to play for a possible national championship. TCU had faced the Cyclone twice previously in their long football history. The Horned Frog won both meetings; a 31-17 victory in the 1998 season opener and a 27-10 win in the 1995 season opener. The third quarter saw little action until Iowa State mounted a six play, 53 yard drive, ending in a 22 yard touchdown pass to Todd Blythe with the PAT good to tie the score at 24 all. The scoring drive took one minute 51 seconds and left 1:53 left on the clock. No other important action happened the in quarter. The first quarter of the EV1.net Houston Bowl, it is evident to everyone in the stands at Relient Stadium that TCU had come to play ball. Touchdowns came on a 20 yard scoring run by Robert Merrill and a 7 yard run by Aaron Brown. Both one point conversionsby Chris Manfreini were good to make the score 14-0 in favor of TCU. Iowa State showed very litttle offense in the quarter rushing for eleven yard and passing for a scant 32 yards. TCU was 12 for 55 on the ground while completing 8 for 12 and 88 yards. In a dramatic change of events during the second quarter, Iowa State came to life, and began to mount a comeback. Iowa State scored seventeen points in the second quarter on a 48 yard touchdown pass from Todd Blythe to Bret Meyer to take the score to 14-7 in favor of TCU. Two points were added on a safety at 12:50 in the quarter to take the score to 14-9 in favor of TCU. Jon Davis scored on a six yard pass from Bret Meyer and followed with a two point conversion to take the score to 17-14 in favor of the Cyclones. TCU then answered with an 84 yard pass from Micha Depriest to Jeff Ballard, and a one poin conversion to take the lead 21-17. With fifteen seconds left int he half, Manafredini kicked a 29 yard field goal to take the score to TCU 24, Iowa State 17. As fans from Iowa State and TCU converge on Houston for the 2005 EV1.net Houston Bowl, one can only wonder what surprises will be in store for this year's match up. 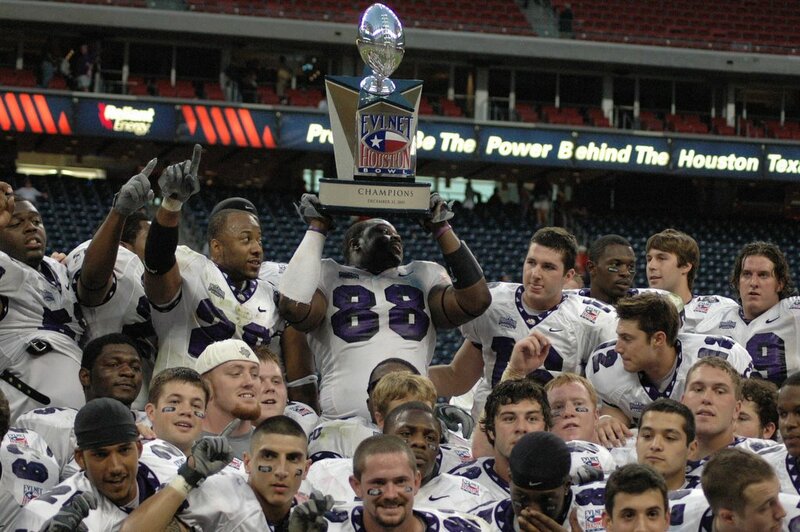 The Houston Bowl had been the scene of high caliber college football, with the added aspect that many of the players will be playing their last college game. Those who will return next season will have the option of living up or down to their performances on this Saturday afternoon at Reliant Stadium. TCU (10-1) is a heavy favorite, but one could not see that affecting the demeanor of the Iowa State players, coaches and staff. Iowa State (7-4) is playing in their fifth post season game in six years, while TCU is making their seventh post season appearance in eight years. The Horned Frogs and Cyclones have met twice previously in their long football history. In 1998, TCU scored 17 unanswered points in the fourth quarter to win 31-21 in Ames, Iowa. In their first meeting in 1995, TCU won 27-10 in Fort Worth. None of this will matter at 1:30 pm on Saturday, as both teams take to the field in their attempt to take home a bowl victory and the glory and prestige that goes with it. The game is scheduled to be telecast on ESPN2 with Dave Barnett on the play-by-play, Tim Brant on color analysis, with Suzy Shuster on the sideline. TexSport Publications will be on hand to bring their unique perspective of the game.